Enter one Géo Lefèvre, the 26 year old chief cycling journalist for the paper. He had a radical idea based on the knowledge that cycling races sell lots of papers. That being the case, why not host a cycle race, a race larger than anyone had ever seen? If this audacious idea should work, then perhaps L'Auto may just match its rival in newspaper sales, or even better, put its rival totally out of business! After more excited meetings L'Auto announced the race on 19 January 1903. After much debate, a format for the race was finally agreed upon. The race was to be run over 19 days, commencing on 1 July. On 1 July some 80 competitors lined up outside the Café Reveil-Matin in the village of Montgeron for the very first Tour de France. The race commenced at 3:16 pm on 1 July 1903. It goes without saying that L'Auto featured the race on its front page that day. After a gruelling race where only 24 of the 80 entrants finished, the title of winner went to Maurice Garin (pictured below). And it should be noted that sales for the newspaper L'Auto doubled due to the race. So it was a cracking success. Not only that, its continued popularity has ensured its longevity. The race still runs annually with competitors from all over he world vying for a place on the winner's podium. 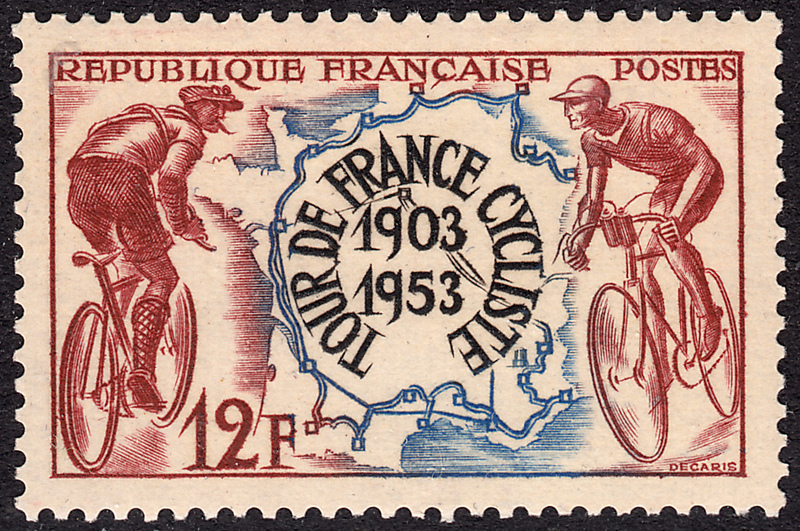 On 25 July 1953 France issued a stamp celebrating the 50th Anniversary of the Tour de France. The stamp was designed and engraved by Albert Decaris. The design of this stamp is fantastic. 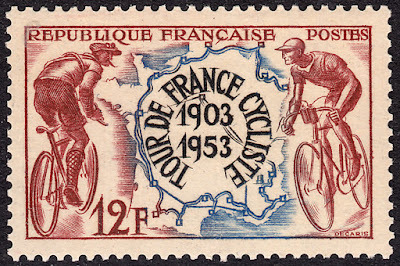 In the centre of the stamp we see a map of France with the course for the Tour de France plotted out. The space within the roughly circuitous route has been used for the title of the stamp. Flanking the map of France are two cyclists. 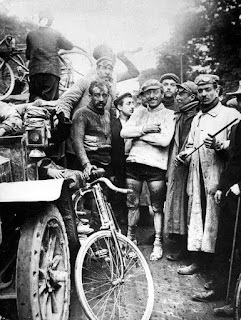 The cyclist on the left is wearing clothes consistent with the early years of the race. 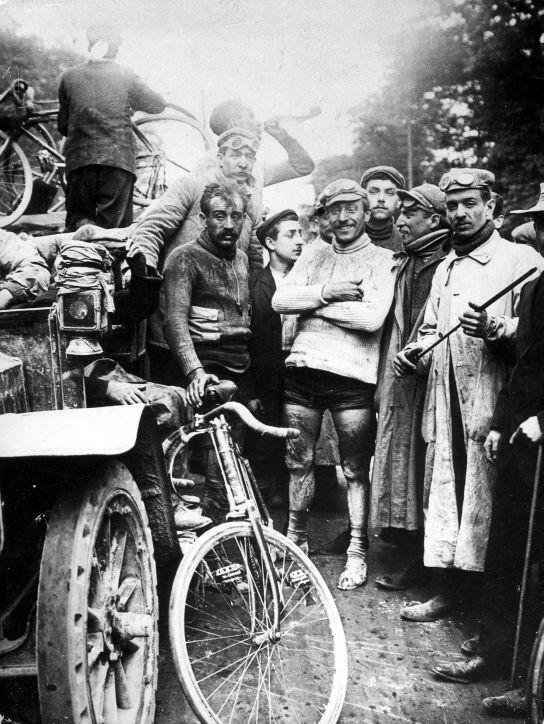 Perhaps this is the winner of the first race, Maurice Garin. The cyclist on the right is a 'modern' rider from the 50's. Great blog! Keep it up - can't wait to see what you'll do next.